We are hoarding oranges. We don’t eat oranges, but they keep turning up, hence the collection. 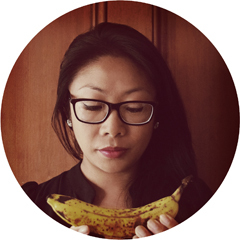 I have good intentions, I mean to eat them, which is why I haven’t cancelled or blacklisted oranges. If we had a juicer we might get through what we we receive from our boxes. Therefore, the next best thing is to use orange as an ingredient. Luckily, we love our meat with fruit in this house and The Koala was eager for me to test out another pulled pork on him. 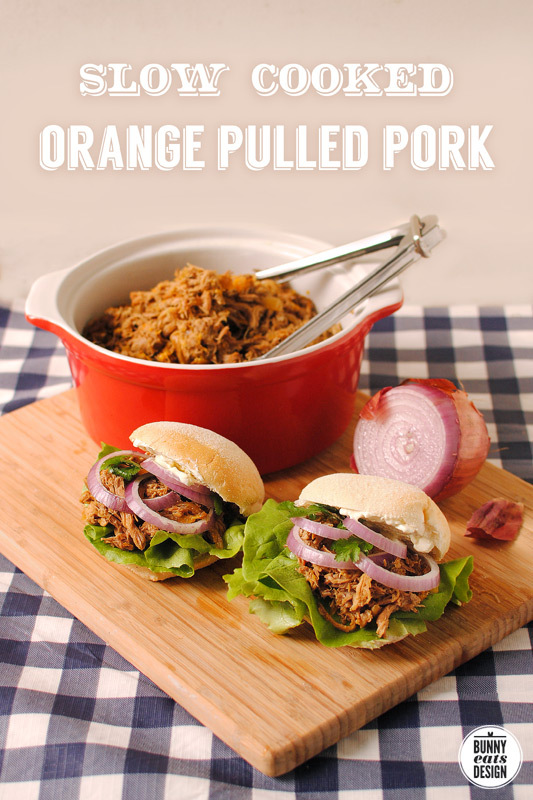 I used a boneless pork shoulder for my Hoisin pulled pork recipe but this version uses one with bone in as it was cheaper this week. Feel free to use either. I am loving our first winter living with a slow cooker. A hand-me-down from Mum, it’s worth the extra space it takes up on our counter. To save on time and dishes, I used the ceramic pot and lid from our slow cooker to marinade in. This requires substantial fridge space so if you don’t have this, feel free to use a smaller container for this step. Using a sharp knife, remove the peel from the oranges. 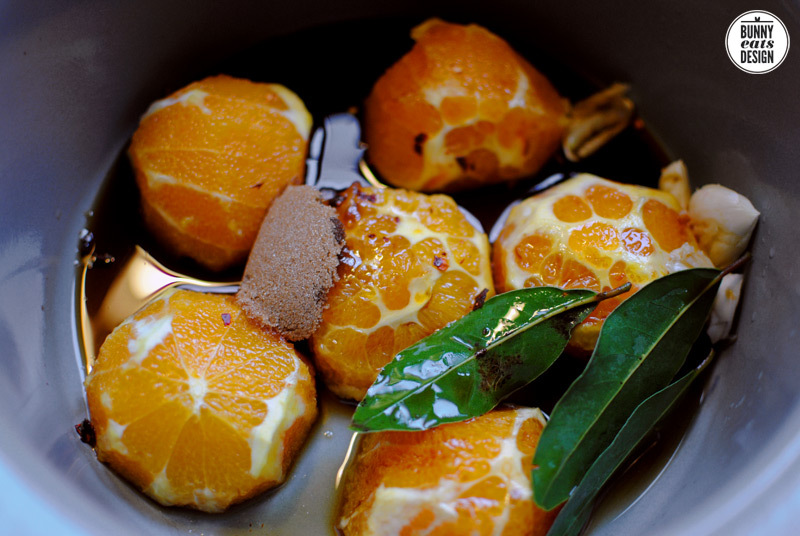 Cut each orange in half, squeeze the juice into the slow cooker and then add the halves into the slow cooker, cut side down. Add soy sauce, brown sugar, chilli flakes (if using), garlic and bay leaves to the to the the ceramic crock. Mix. Add the trimmed pork and turn the meat in the marinade to coat all sides of the pork. Pop on the lid on the ceramic crock and place the crock into the fridge to marinate overnight. 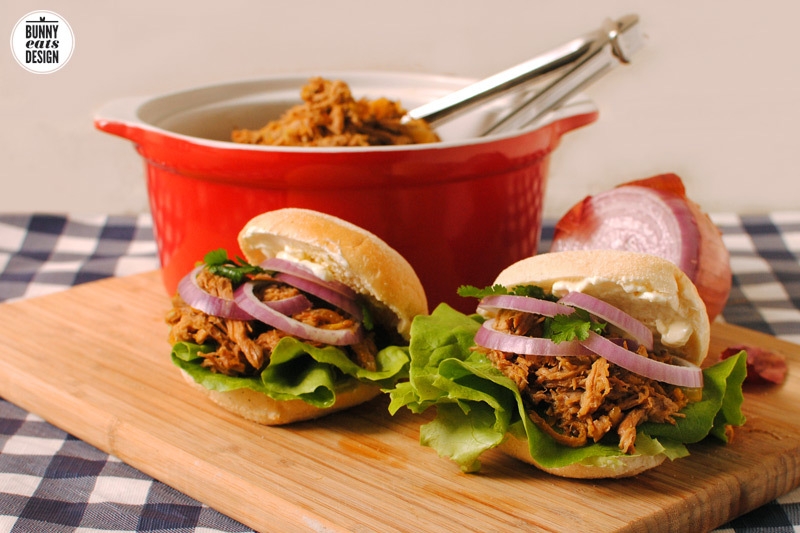 Take the ceramic crock out of the fridge and place into your slow cooker for 20 minutes before turning it on. Peel and slice 1 onion. Add to slow cooker. Cook pork for 8 hours on low. Turn pork once (if possible) during the cooking process for more even cooking. When pork is cooked, remove and discard all mention of bone and the 3 bay leaves. Ladle out as much liquid as you can into a saucepan and boil, uncovered until reduced by at least half. In the meantime, shred the meat while still inside the slow cooker by gently pulling it apart with 2 forks. Add the reduced sauce back to the slow cooker and mix the shredded pork into the sauce. Taste and add salt and pepper to your own preference. Serve with your choice of soft tortillas, bread rolls, salad, sour cream, mayo or guacamole. I also make sure there’s a bottle of hot sauce on the table. Keep tea towels or napkins in easy reach. For lunch on Saturday: Start marinating the pork on Friday morning. Start slow cooker on Friday night. Pork will be ready to pull on Saturday morning. For dinner on Sunday: Start marinating the pork on Saturday night. Start slow cooker on Sunday morning. Pork will be ready to pull on Sunday evening. I once thought you could only crackle the skin on pork belly but you can actually work magic on any pork skin. I used to throw out pork shoulder skin, now I know better! Once the pork skin is removed, place on a chopping board, fat side down (skin side up). Using a sharp knife, carefully make vertical or diagonal cuts 5mm or ¼ inch apart along the skin, cutting all the way through the skin but not all the way through the fat. This will enable the skin to crisp up nicely and make it easy to cut later (or break apart once cooled). Cover with a generous sprinkling of coarse sea salt, rub salt into cuts and place the skin on an oven proof tray (I used a square cake tin) and refrigerate overnight uncovered. This will dry out the skin further. An hour before serving, pre-heat the oven to 220°C. Bake pork crackling for 20-30 minutes until crunchy and golden (even bordering on black in the tiniest of places). Remove from oven allow to cool enough to cut or break apart. 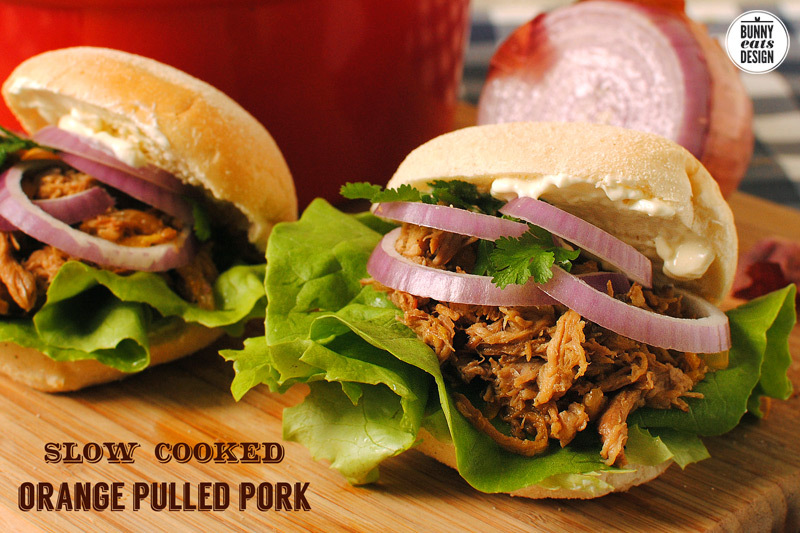 Adds a lovely crunch to a pulled pork tortilla! 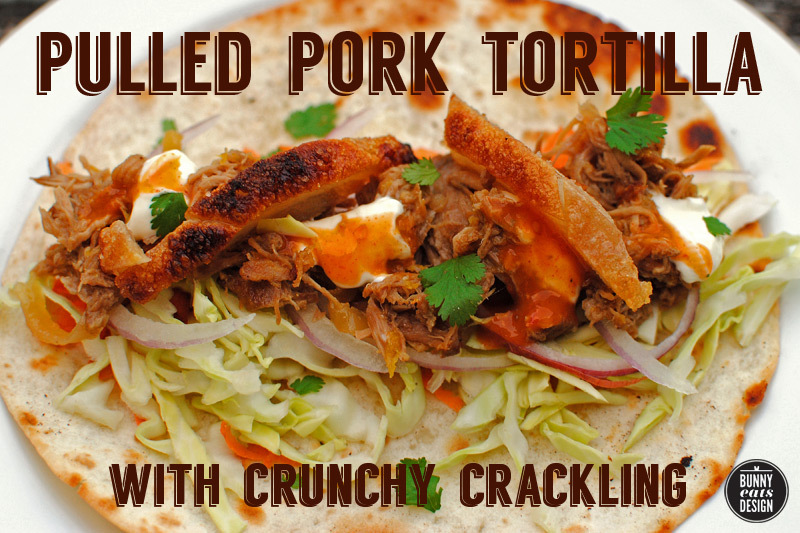 Tip: The more fat clinging to the skin, the more chewy your pork crackling will be. Too little fat and your crackling will be dry and hard – like a potato chip. I like a little bit of that lovely gelatinous fat so remove the skin accordingly. That looks fantastic, Genie! Good to do the shredding in the crock. One less dish! You use to throw out pig skin???? That’s a sin!!! Which did you prefer out of your two slow cooked porks? I have a shoulder that I’m going to slow cook. I was going to use your first recipe, and now you go and confuse me with this. Too many delicious pork options!!! We preferred the first one. It is easier too! This makes my mouth water with anticipation! Oh my gosh, this looks ridiculously amazing! Wow! !